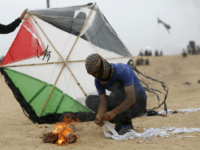 TEL AVIV – UN Secretary-General Antonio Guterres called on Hamas Saturday to stop sending incendiary balloons and terror kites over the border and risk “another devastating conflict” in Gaza. Two fires blazed near Israeli communities near the Gaza Strip Saturday afternoon, caused by incendiary kites flown into Israel from the territory. Close to 100 days since the first incendiary kite was launched from the Gaza Strip toward Israel causing fires to ravage the south, the IDF has deployed a system that can spot incendiary aerial devices launched from the Gaza Strip, track them and direct firefighters to where they land. Firefighters battled to fight five blazes sparked by incendiary devices flown toward Israeli communities from Gaza on Saturday. 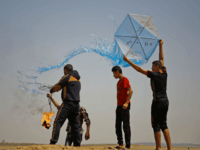 TEL AVIV – The Israeli military has set up a “war room” to handle the wave of “kite terror” emanating from the Gaza Strip, which the IDF says the Hamas terror group is coordinating. Israeli drones carried out two airstrikes on targets in the central Gaza Strip on Sunday, Palestinian media reported, including one that destroyed a motorbike that the military said was used by a cell sending incendiary balloons into southern Israel. 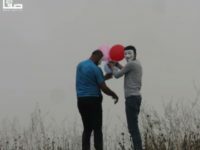 Facing a wave of airborne incendiary attacks from the Gaza Strip, Israel has deployed a system that can spot fire-starting balloons and kites in the sky, track their progress, and then direct firefighters to their landing spots, enabling them to more rapidly extinguish the flames and reduce damage. The Gaza-based Hamas and Islamic Jihad terror groups claimed responsibility for the rocket barrage at Israel early Wednesday, warning they will not allow Israeli strikes in the Palestinian enclave to go unanswered. Education Minister Naftali Bennett on Monday called for the use of lethal force against Palestinians launching incendiary devices from the Gaza Strip into Israeli territory, saying that exercising restraint will only serve to escalate the ongoing arson attacks that have caused hundreds of brush fires in the southern part of the country in recent months. The Israeli military said Sunday its aircraft had targeted a leading Gazan figure launching incendiary balloons and kites into Israel. 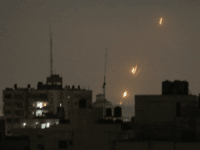 The Israel Air Force attacked two Hamas observation points in retaliation for explosive rigged balloons over the weekend as fires continued to rage across southern Israel from incendiary devices launched from the Gaza Strip. 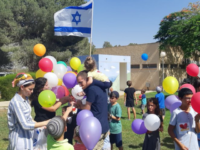 TEL AVIV – Several fires spread across southern Israel on Monday as a result of attack kites and balloons flown over the border by Palestinians from Gaza, officials said. 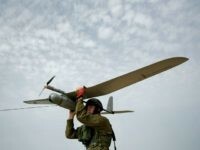 An Israeli arms company has developed a new drone to counter the threat posed by incendiary kites, hundreds of which have been flown over from Gaza to Israel’s southern communities over recent weeks, causing numerous fires that have ravaged farmland and trrorized residents. 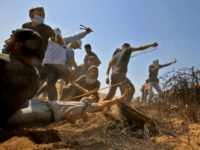 Approximately 10,000 Palestinian rioters thronged the Gaza border Friday in ongoing mass chaos planned by the Hamas terrorist organization with the stated goal of storming into Israel and murdering Jews. Prime Minister Benjamin Netanyahu on Sunday ordered Israel to withhold funds from the Palestinian Authority, in order to compensate farmers living on the Gaza border who have had their crops destroyed by massive fires sparked by flaming kites sent from the Palestinian enclave.